Release Date: July 12, 2007 outside U.S.
Bluesy, twangy, rocking, rootsy, and organic, with plentiful mandolin, dobro and accordion alongside the electric guitars, the latest offering from BURRITO DELUXE is enough to restore your faith that real music  that is, great songs played and sung with soul, feeling and conviction by top-notch singers and musicians without undue concern about demographics, focus groups and the like  is still being made. 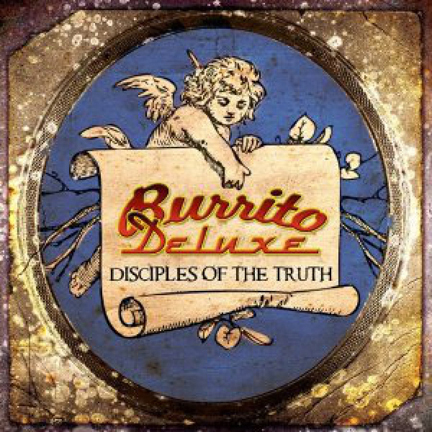 The acclaimed band’s new CD, DISCIPLES OF THE TRUTH, will be in U.S. stores Feb. 27, 2007, on Luna Chica Records, with national distribution through an exclusive agreement with CBuJ. BURRITO DELUXE is Carlton Moody on lead vocals, acoustic guitar, banjo and mandolin; Walter Egan on electric guitar and vocals; Jeff “Stick” Davis on bass and vocals; Richard Bell on piano, organ, clavinet and accordion; and Bryan Owings on drums and percussion. Together they create a sound at, at various times, calls to mind such forebears and contemporaries as The Byrds (with and without Gram Parsons), The Band, Tom Petty, the Amazing Rhythm Aces and the Ozark Mountain Daredevils. 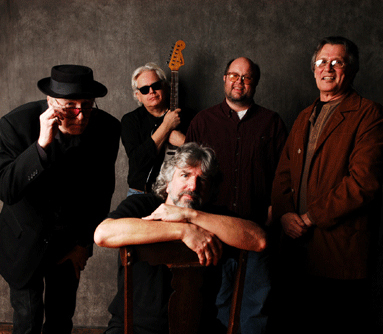 All-star guest musicians include band patriarch, the late “Sneaky” Pete Kleinow, whose pedal steel magic graces several of the tracks; the session earlier this year turned out to be the final studio appearance for Kleinow, who passed away on January 6, from complications with Alzheimer’s disease. Other notable guests are Cindy Cashdollar, Mike Daly and Al Perkins on steel and Dobro; Daniel Dugmore on steel and banjo; Barry “Byrd” Burton and Richard Ferreira on guitars; and percussionists Craig Krampf and Rick Lonow (a former band member), while background vocals are provided by the likes of Joy Lynn White, Rick Schell and Blue Miller. BURRITO DELUXE contains several talented songwriters, and they contribute several songs to the album. The opening cut, “Out Of The Wilderness” (Bell, Colin Linden, Jim Weider), rides swirling accordion and Dobro atop an emphatic two-step, almost Cajun beat in the verses. “Front Row Seats To Heaven” (Moody, Rob Crosby, Craig Karp) celebrates a Smoky Mountain lovers’ getaway. “On A Roll” (Egan, Rick Schell), featuring lead vocals by Egan, would be a smash for Tom Petty. “Encino” (Moody, Crosby, Karp) calls to mind a Marty Robbins outlaw ballad set to a loping country beat. “Wrong Side Of Town” (Moody, Davis, Bell, Egan) is a melancholy masterpiece. The band also shows excellent taste in recording a number of songs by outside writers. “Sun Will Rise” (Edwin McCain), already a European hit, jumps out of the speakers with the force of a steaming cup of fresh-brewed coffee. “Disciples Of The Truth” (Tommy Conners, Clay Blaker), the first single, is a flat-out rocker that gleefully recalls a musician’s “misspent youth.” The gorgeous “Wichita” (Houston Roberts, Dave Turnbull, Roxie Dean, Rivers Rutherford) is a rambler’s rumination on a lost love. “Midnight At A Red Light” (George Hamilton V) is a rollicking and irresistible tale of a naïve young man and the femme fatale who turns his life upside-down. DISCIPLES OF THE TRUTH is 12 songs strong  and 12 strong songs at that. No gimmicks, no filler, just a hearty feast of country and roots rock. If you’re not a believer, this CD will make you one. News updates, road stories, audio clips, high-res JPEGs, band bios and more available at www.burritodeluxe.com.